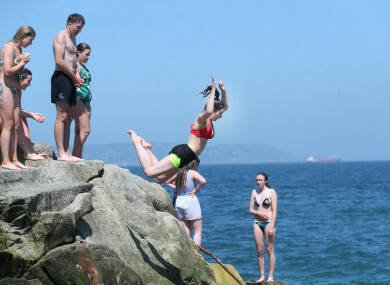 Mary Kate Kiernan from Trim Meath jumps into the sea at the Forty Foot in Dublin during the sunny hot weather. THE SUN MAY be hidden in the clouds today but forecasters have predicted that it’s to remain dry and with decent dry spells until Wednesday – that’s when the rain’s expected. While we’re not going to bask in the temperatures we enjoyed for the last week or so, Met Éireann said that it could reach 20 degrees in some parts of the country – most likely in the south. The forecast reads: “It’ll be rather cloudy today but there’ll be sunny spells and it will be a largely dry day, with just isolated showers, these mainly in the northwest. While temperatures are expected to remain in the high teens to early twenties, the experts have warned that rain is due. “Wednesday will start out dry and warm but increasing southerly winds will bring a change in the weather conditions. Clouds will increase along the west coast and thicken to bring rain there by afternoon. Email “Stick the barbecue back in the shed - rain is on the way this week”. Feedback on “Stick the barbecue back in the shed - rain is on the way this week”.